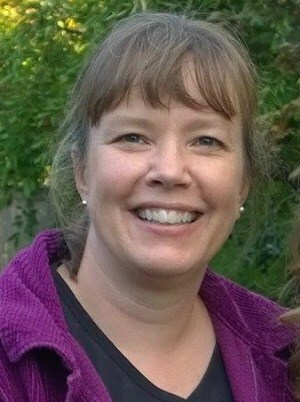 Beans are one of the easiest vegetables to grow. There are two types of beans you can grow: fresh green beans and dry shelling beans. I find that the easy way to preserve green beans, is by freezing them. Freezing them, also maintains some of that crisp texture and fresh flavor, that gets lost when canning them. Dry Shelling Beans are even easier to preserve, just dry them! Be sure to check our all of our Food Preservation related posts! Also, be sure to check our all of our favorite Homesteading and Gardening tool in our Amazon Shop! Just to be clear, when I say green beans, I am talking about string beans vs dry beans. Varieties of string beans that I am talking about are Provider Green Beans, Yellow Wax Beans, Kentucky Pole beans and many others. These are also referred to as snap, green and wax beans. I am not referring to beans that you grow for dry shelling beans, such as Black Turtle Beans, Cannellini Lingot Beans or Dark Red Kidney Beans. Dry Shelling Beans, are grown for the seed inside the string bean, whereas string beans, are grown for the whole bean , where you eat the shell and the seed beans inside. These are the easiest beans of all to preserve. 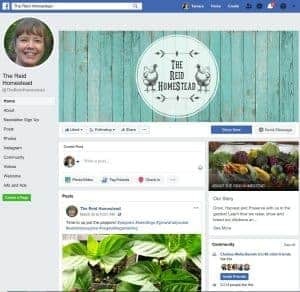 You let the beans dry out, either while still in the garden, or if you are expecting a frost, pick the whole plant and bring into a dry place like a garage. Once the plant has dried up, you just shell the beans, and collect the seed. The seed is the actual dry bean. Some examples you might be familiar with are kidney beans, white cannellini beans, pinto beans, black beans, etc. Once the seed beans are completely dry, you can store them in jars in a cool dark place for at least a year or two. Than soak before using, or pressure can a large lot of them to have them at the ready for quick cooking. To easily preserve the fresh string beans by freezing, you want to pick them when they are young. Do not wait until the beans are bulging from the seed inside them or they will be tough and chewy. Pick them when they are long and slender. Wash them thoroughly to remove any dirt or debris. It is a good habit to mulch around the beans with straw or woodchips, to prevent the dirt from splashing up onto the plants when it rains or when you water from overhead. If mulched, the beans remain much cleaner. After washing them thoroughly, cut off the stem end, and cut them into 1-2″ pieces. Most veggies require a quick blanch before being frozen. Blanching is just submersing them in boiling water for a few short minutes, and then putting them quickly in an ice water bath to stop the cooking process. 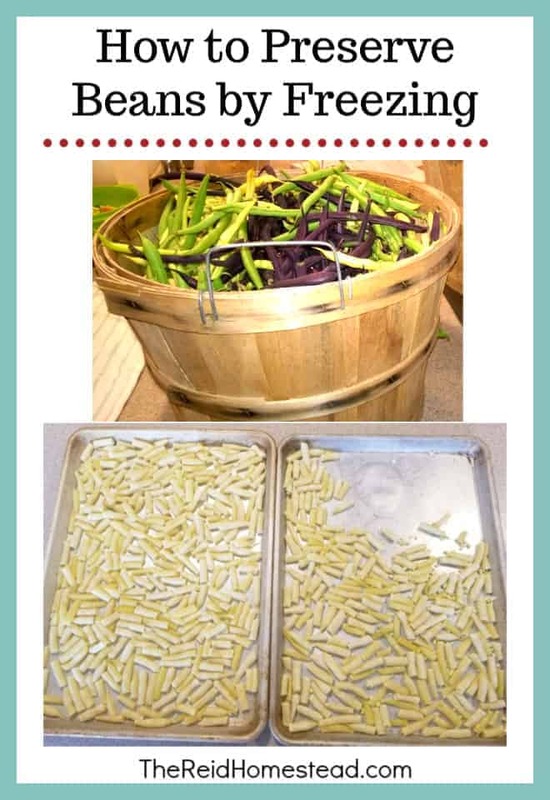 The blanching process helps to retain the vegetable color, flavor, and nutrients and it also kills off enzymes that are beginning to break down the vegetables and also kills any surface organisms that might still be there after washing them. 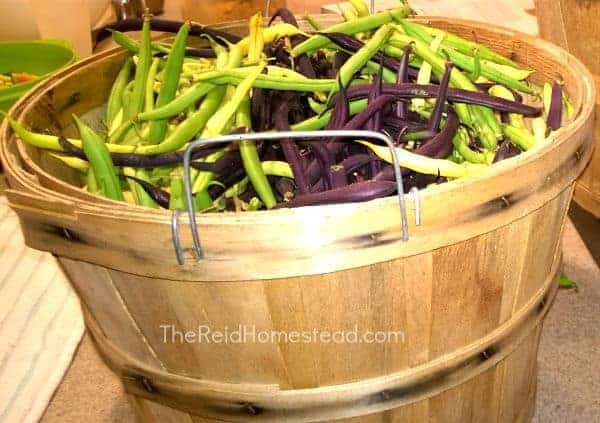 For beans, you want to bring a large pot of water to a rolling boil, using 1 gallon of water per 1 pound of prepared vegetables. At the same time you are waiting for the water to boil, fill a large bowl with ice cold water, and ice cubes. The water should return to a full boil within 1 minute. If it doesn’t, you are putting too many vegetable into too small an amount of water. Begin timing when the water returns to a full boil, and time for 3 minutes. After 3 minutes, remove colander and beans from boiling water, and immediately place into the ice water bath. After the beans have cooled off, and are cool to the touch, remove them from the ice water bath. I like to have some towels layed out at this point and dump the beans onto the towels. Move the beans around so they are mostly laying in a single layer and then gently roll the towel up with the beans inside, to remove most of the excess water. 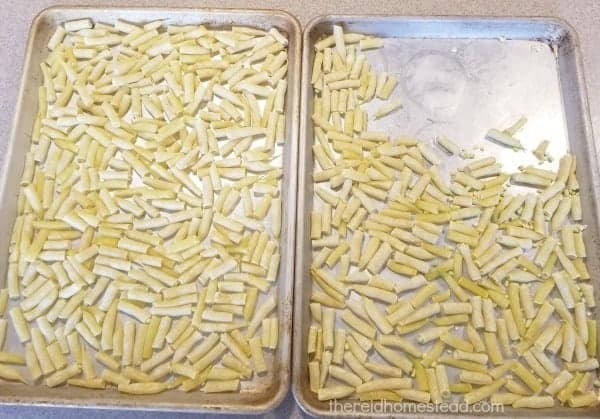 Once they are dry, move them onto a cookie sheet, or a few cookie sheets, if you have a lot. Make sure they lay in a single layer, and do not touch. Place the cookie sheets in the freezer until the beans are frozen. 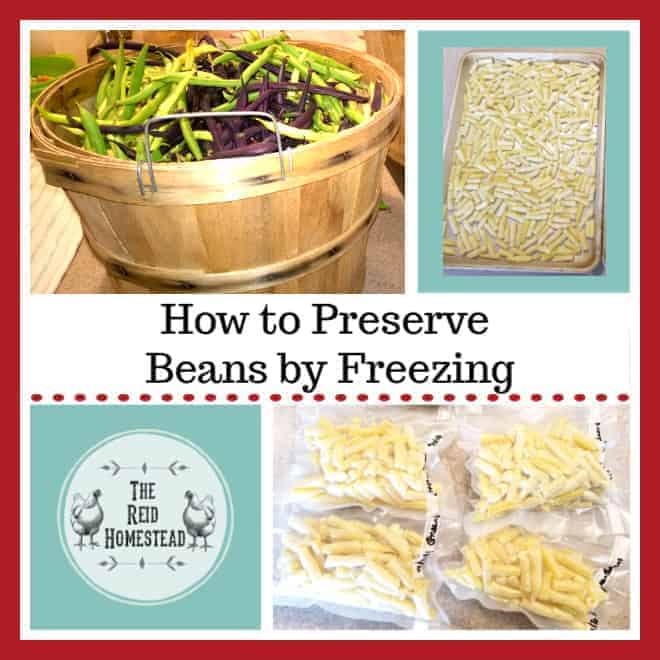 This step of drying them in a single layer on the cookie sheet, prevents them from freezing into one large clump of frozen beans. 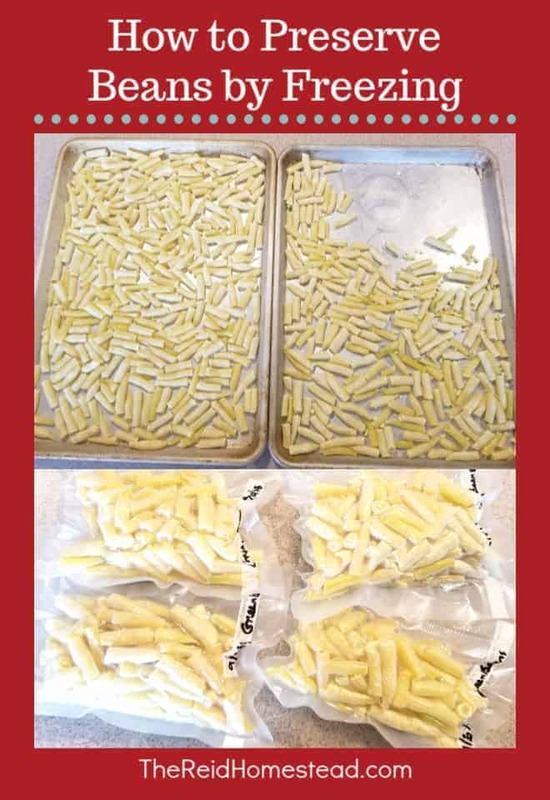 By freezing them individually first, they remain loose when freezing them in bags in the next step. When the beans are fully frozen, use a spatula to scoop them up off the cookie sheet. 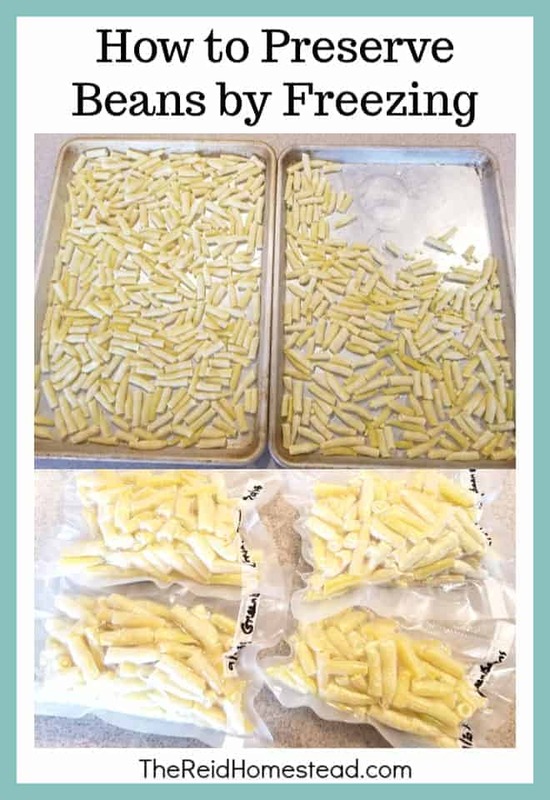 Then you need to place them into containers to store them in the freezer. 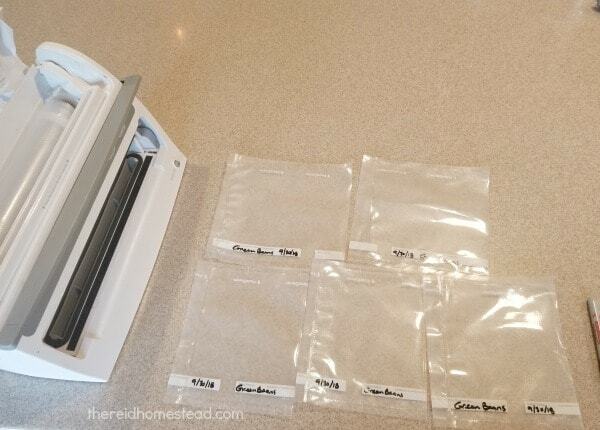 I prefer to use my Foodsaver for this, as it removes the air from the bags which eliminates freezer burn. 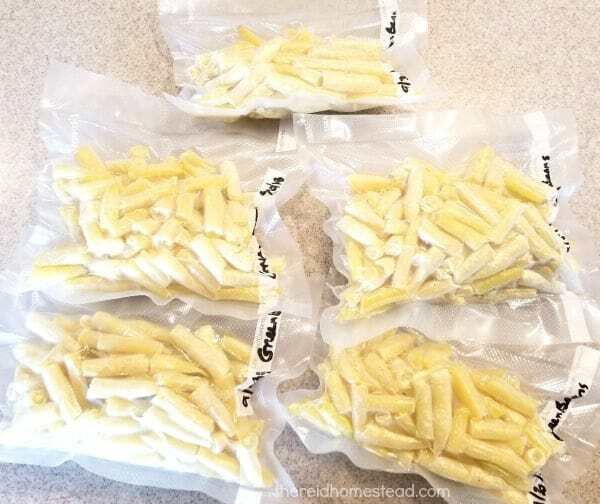 Other options are zip lock bags or plastic or glass containers, but they will not store for as long. Don’t forget to label and date your containers or bags, and be sure to use the oldest ones first.